I understand that Matt Murray backstopped the Pittsburgh Penguins through the Stanley Cup playoffs on the way to their 4th Stanley Cup. I realize that he is only 22 years old. And I get that he may be a better fit in the Penguins' long-term plans. The discussion surrounding which goalie will be traded, and when they'll be sent packing have dominated much of the off season and lingered throughout the preseason. 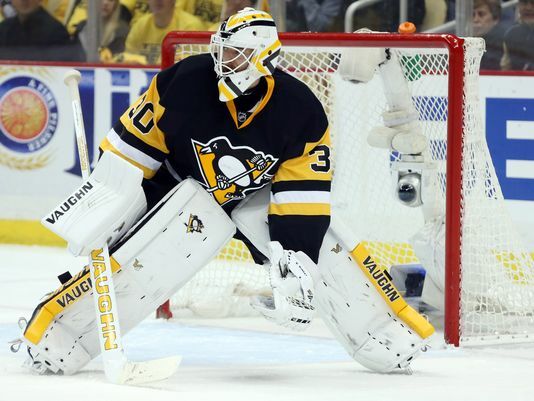 Some have speculated that Fleury's future in Pittsburgh is murky at best. BUT, the potential return on a trade for Matt Murray is intriguing given the same circumstances (age, talent, contractual control and affordability) that make him a fit for the Penguins plans. He's 22-years-old, a Stanley Cup champion in Wilkes-Barre in 2014-15 Murray set AHL records for the longest shutout streak and the most shutouts by a first-year player. Murray also posted an incredible 6-0 record, with a 1.64 GAA and .936 save percentage in games AFTER a loss this spring. This was during a Stanley Cup run after playing just 13 career games in the National Hockey League. By all accounts, Matt Murray is going to be a quality NHL goaltender for many years to come. That pedigree and those numbers certainly make Murray, and with Tristan Jarry showing a strong progression this preseason, could that make Murray the odd man out? Jarry is 3-0-0 this preseason and has stopped 61 shots in the process. I understand this is the preseason, but the numbers are still impressive. With a recent round of cuts, it appears Penguins coach Mike Sullivan has committed to Jarry as the backup while Murray recovers from a hand injury. "Certainly we're encouraged by Tristan's play. We know how good a goalie he is,” Sullivan said. “As I said, I had him last year for a period of time, and he has the ability to be a real solid goalie with what you've seen the last couple of games." Tristan Jarry with his 2nd straight shutout in the preseason. Start to his 2nd pro season looking good so far. Murray’s injury could keep him out until early November, giving Jarry the opportunity to get a start or two before returning to Wilkes-Barre. He’s also young, 21-years-old and went with a 2.69 GAA and .905 save percentage as a first-year pro in 2015-16. But back to the question, and allow us to take into account all of the factors for why Murray is a viable option, and measure them to Marc-Andre Fleury. Fleury is 31-years-old, still relatively young for a goaltender and historically entering the "prime" of a goaltender's career. By comparison, Martin Brodeur didn't win his first Vezina trophy until he was 30 years old. He went on to win three more at ages 31, 34 and 35. Dominik Hasek didn't win his first until age 29. He won five more awards, including three-straight in '97 (32) '98 (33) and '99 (34) above the age of 30. He was 36-years-old when he won his last award. Tim Thomas? Two Vezinas, ages 34 and 36. Billy Smith won his only award at 30 and Ken Dryden won two in his 30s. Terry Sawchuck? 35 when he won his last Vezina. Marc-Andre has had his struggles, but they’re largely behind him. He’s got plenty of productive years ahead of him. Fleury was a #1 overall draft pick for the Penguins in 2003 and has now won two Stanley Cups. His goals-against has decreased from each year from 2.39 in 2012-13 to 2.29 last year. During the same span, his save percentage has increased. He’s the franchise leader in career wins (357), career shutouts (43) and shutouts in a single season (10). He also sits in second place behind Tom Barasso for most wins in a season, 42. Barrasso won 43 in 1992-93. Fleury signed a four-year contract extension in November of 2014 that kicked in this past season. He’s signed through the 2018-19 season to a deal that pays him $5.75 million per year. That deal also includes a no-movement clause that he could exercise to protect him from any expansion draft. This also presents a problem for the Penguins. Teams could potentially lowball the Penguins on trade offers knowing that Fleury controls where he could and couldn’t go. This could also be another reason why Fleury stays. There are 13 other goaltenders that make more per-year than Fleury. Henrik Lundqvist leads the pack at $8.5 million per year, and rightfully so. Braden Holtby, the reigning Vezina Trophy winner lands at sixth in the league at $6.1 million per year. Last year’s winner, Carey Price is fifth. But do you know who is more expensive than Fleury? Kari Lehtonen and Semyon Varlomov ($5.9 million), Corey Schneider ($6 million) and, wait for it…. Sergei Bobrovsky, whose salary is the second largest for a goaltender in the National Hockey League at $7.4 million. Considering some of those figures and the resumes attached to them, Fleury is a relative bargain. Again, notion of trading Matt Murray at this point is purely speculation, as there are no media reports of anything remotely resembling a trade right now. This particular plan would of course be contingent on how Tristan Jarry progresses. Jim Rutherford has shown his ability to fully vet trade options, particularly in the deal for Phil Kessel. Is this one scenario he's mulled over?